First of all, getting stung by a bee, wasp or yellow jacket can hurt. So, below are some bee safety tips designed to keep you and your family safe. Because some people are allergic to bees stings, getting stung can pose a serious problem. Therefore, keep these bee safety tips in mind when dealing with any bee, wasp or yellow jacket issues you may have. Attempt to remove a beehive yourself because you will probably get stung. Approach a buzzing hive. Stay at least 20+ feet away so the bees do not feel threatened. Swat a bee near its hive/nest because you may agitate the bee. Spray a beehive or a bee swarm (clump of bees) with water or insect repellant. Light a fire in the fireplace to smoke bees out of a chimney because the heat may melt the honeycomb and attract bees and critters for years to come. Attempt to flood or fill with sand or other material any yellow jacket nest in the ground. Wear bright colored clothes near beehives because bees may mistake you for a flower and approach. Wear open-toed shoes because bees, wasps or yellow jackets may be on the ground and sting your feet. Use perfume, cologne, scented soaps or powders since the fragrances may attract bees. Keep a safe distance from a beehive. Open a window for a bee to escape if caught inside a home/office. Cover the fireplace with a black trash bag if bees are in the chimney (bees are attracted to light and may enter your home). If being attacked by bees, cover your face and run away. Tie back long hair to prevent bees from getting entangled in your hair. Be careful when shaking out towels or clothing as bees may be stuck in the folds. We have a graphic that shows you where bees like to make their hives here. If you get stung and are experiencing any of these symptoms (within minutes or up to half an hour after), call 911 immediately. Hives, itching, and swelling in areas other than the sting site. Dizziness or a sharp drop in blood pressure. In conclusion, our bee safety tips are designed to keep you and your family safe. 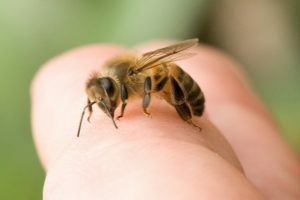 If you find you have a bee problem, please call us at (949) 455-0123. We are available 24/7 for emergency bee removal.